As you look back over your life, has it turned out as you had hoped it would? Did God follow the script you would have written for your life? He didn’t for me. If He had followed my script, I would be married. I would have children and grandchildren. We’d never have to worry about money. We’d be healthy. My husband and I would stay madly in love until Jesus takes us home together in our sleep one night. That was my plan, but it wasn’t God’s. God’s script for my life includes singleness and unfulfilled dreams in several areas. Can I, will I, trust God for His plan for my life? What are we to do when life takes an unexpected turn, or we don’t know where God is leading us, or we don’t understand why He’s not answering our prayers the way we want? Trust. Where are we to place our trust? In other people? Material things? Money? A job? Trust in the LORD. Trust in the LORD forever! We’re not to just trust for a little while and give God a deadline. God, I’ve waited long enough. I’ve trusted You to do something with this, but You’re silent, and I need to take things into my own hands and handle it myself or put my trust somewhere else. You’re taking too long. 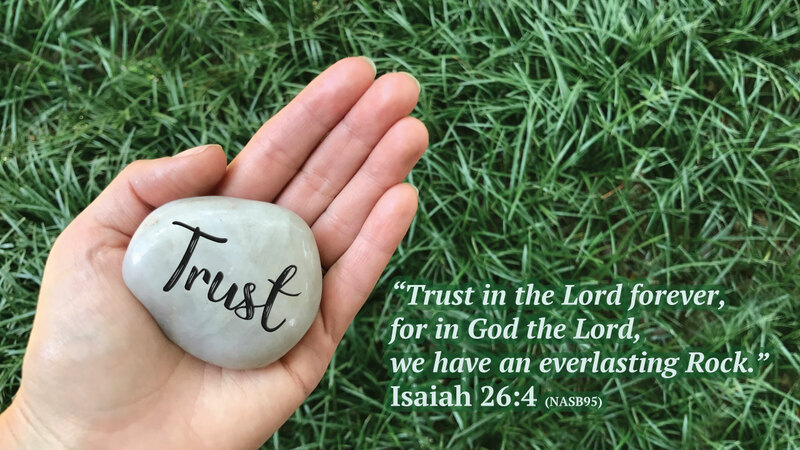 We’re to trust in the Lord today, tomorrow, the next day, and the next — until we’re face to face with Him, and then we’ll see what He’s been doing all along. We’ll see the big picture that He sees today, and we’ll say, now I understand. Why should I trust in God instead of someone or something else? For in God, the LORD, we have an everlasting Rock. A rock is an image of strength and protection. A rock is never destroyed. It lasts forever. It weathers the storms of life. It offers protection and stability. God is our Rock. What is the script you would have written for your life? What did you envision your life to be like? For some of you, life has been good. Things have turned out well and you’re happy with the path God has taken you down. But some of you have seen life take a different direction than you had hoped or planned for – you’re single; you’re childless; your husband died much sooner than you had planned; you’re in a difficult marriage, or your husband left you; you’ve received a diagnosis that has changed your life; your children have strayed from God . . .
Can we trust God when life doesn’t go as we had planned? Can we trust that God’s plan is better for us than ours? What has helped you grow in the area of trusting God? This is such a great post, Crickett. You are an inspiration to many, my friend. Cathy, thank you for your sweet, encouraging words! I appreciate you!